How do you make an animation in a language you’re still learning? How is lip sync in MMD affected by different languages? What was the process for making “Boum Boum Boum”? In the summer of 2018, I went to Quebec to learn French in a language immersion program. This program insisted that we talk and write in French as much as we could. I wanted to do some animating while I was there, but the project I was working on at the time was in English. That just would not do. I decided to start another project in French so I could use it to practice French words. I listened to many popular French artists I hadn’t heard of, but none of their songs made me think “I should animate this.” Then, I found a video featuring two artists I already knew, Mika and Cœur de Pirate, performing at a festival in Montréal. The song they sang together is called “Boum Boum Boum”. I had listened to it in high school, but it didn’t have a huge impact on me. This duet did. The way Cœur de Pirate’s voice mixed with Mika’s had a certain “Je ne sais pas si c’est les accents ou les paroles, mais le chanson est ben chix!” In other words, I loved it. It was flirty, playful, and fun without being blatant. I could make a video that was equally classy. Now that I had a song, I had to find models. I prefer to get models as I need them, so I didn’t have anything that I thought would match the tone of the video. I wanted to find models that were formally dressed. 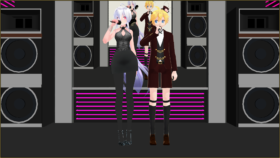 After a bit of hunting, I found xXMoufuMofuXx’s TDA Fancy Len Kagamine and Saryta-chan’s TDA Office Haku V2. These models were dashing, and, honestly, who doesn’t like a person in a nice suit? Everyone likes a nice suit. 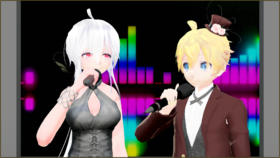 I stopped by Trackdancer’s Deviantart page to download a set of microphones. I already had TD’s nightclub stage. With the characters dressed to the thirty-ones and the set perfectly set up, I was ready to go. I decided to make the animation roughly based on the original video clip. That meant the video would start with just the male (Len) on stage before the female (Haku) arrives. I watched the video a few times, noting the general ways Mika and Cœur de Pirate moved. Those notes formed the basis of my animation. However, I did not want to completely copy the original video, so I didn’t watch the original video once I started animating. My notes were my main guide. Since the main animation was just people standing around and singing, the notes mostly revolved around tone. After the body animation was done, I popped into Face and Lips to animate the mouths. It was fun, but it was probably more difficult than it should have been because I was learning French phonetics. Figuring out which mouth shape goes with which sound can be tricky when you can’t make the sounds yourself. Animating the facial expressions was easy once the lips were synced. Above: What the computer decided to display in the animation window. Below: What it should look like. 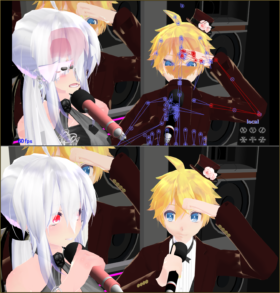 Restarting MMD will fix this issue. Effects are usually easy for me, but for this video, it seemed I had to fight every step of the way. I had originally planned to use a screen-cast background until I decided that looked too awkward and made a separate video for the background. The video is a combination of VMDSpectrum, WorkingFloor, and partially set-up Raycast. The video’s final dimensions ended up being 480*270 because MMD kept saying it couldn’t read the AVI after a certain point and I figured it was a memory issue. Was it? Who knows, but my hack seemed to work. I used GShader on the main video, as well as ExcellentShader to smooth shadows and DoF to try to make the pixelated-ness of the screen video less noticeable. I had originally planned to add subtitles to the video, with the French lyrics at the top and my own hand-translated English version at the bottom, but I don’t quite have the linguistic capabilities to translate something that complicated at this time. https://www.youtube.com/watch?v=MfNHIhuAQjE Making this has certainly been a learning experience in more ways than I had planned. With each creation, I’m improving. I hope that this experience will help you learn. If you have questions or want advice, leave a comment. I’d be glad to help. 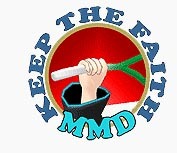 Remember to Keep The Faith and credit all of your resources.